We all know the importance of living a healthy lifestyle but sometimes it is easier said than done. I make my husband put on this bird outfit when we surprise the kids with a Healthy Lifestyle award. This is particularly true for schools where budget constraints or limited resources often clash with costly wellness programs and healthy food initiatives. It can be a daunting task, especially when the ultimate goal seems so far away. As a mom of three school aged children, I am all too aware of the obstacles. I am also proof that despite it all, a successful Healthy Lifestyles program at your school is still possible. I know because I Chair one at a K-5 public school in Williamsburg Virginia. What started with a few steps in 2011 has since become a model for not only our community, but healthy school initiatives everywhere. Along with the support of school, PTA and some occasional volunteers, the Healthy Lifestyles Committee was able to successfully operate a Farm to School Local Produce Initiative, healthy food sampling, chef demonstrations, healthy lifestyle events and programs, an awards program and more. We find the school newsletter and flyers are helpful in finding volunteers, but more often we find ourselves turning to Twitter, Facebook, and our own PTA website to spread the word. Sign Up Genius is also a helpful and free service that will allow you to find and organize volunteers. Assembling a list of like-minded parents, teachers and community members who are willing to help is great way to assure your success. You will likely find people who are just as passionate as you about the health and wellness of children at your school. It doesn’t take an army – just a few, passionate supporters will do. There is no one size fits all approach. Some schools will benefit from emphasis on physical activity or exercise programs. 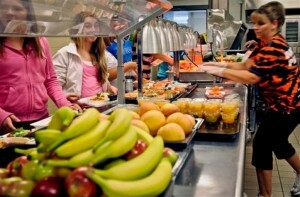 Others want focus on school lunches. While you are probably tempted to do it all, it is best to start small with the issues most important to your school. At Matoaka, we did this by creating a cafeteria task force responsible for discovering the needs of our school community. Using a free survey tool (found on the Internet), a questionnaire was constructed to find out what parents thought about school lunches and snacks. Approximately 55% of our families participated and the results were very clear: 92% of those surveyed wanted a Local Produce Initiative and 61% were willing to support in financially. • Start a Farm to School or Locally Grown Produce Initiative. Our first task at hand was to set up a Farm to School program. We selected a local farm who could deliver enough produce to cover the approximately 700 children at our school plus extra for staff and sampling. This involved the support of not only the PTA but also our school Principal and Williamsburg James City County School Child & Nutrition Services. Our committee also worked with the cafeteria staff to coordinate the deliveries and decide on a dish for the children using the local produce. Considering PTA funds and logistics, we decided to feature local produce on the school lunch line on selected Thursdays to coincide with days when pizza was offered as the main entry. Not only do more children purchase a school lunch on “pizza day” but the cafeteria staff have less prep work therefore giving them more time to work with our local produce. The Healthy Lifestyles Committee was on hand in the cafeteria to encouraged the children to select the fresh vegetable. This also gave us the opportunity to talk with the children about not only healthy eating habits but also gardening and even farming and our local community. Our first offering was spaghetti squash which was prepared with a light marina sauce. Most of the children had never seen spaghetti squash before but were intrigued since it so closely resembles pasta. We created a lot of new squash lovers that day and were absolutely thrilled with the success of our first event. In the months to come we offered asparagus, sweet potatoes and even kale, just to name a few. The National PTA created Healthy Lifestyles Month where throughout the month of November, they encourage schools and families to organize or participate in programs that promote health and wellness. At our school, the Healthy Lifestyle Committee along with our Wellness Council dedicates a full week in November to healthy events and activities that include classroom cooking demonstrations, local produce tasting, “Fitness Minutes” and visits from the OrganWise Guys and more. Our Healthy Lifestyles Committee was looking for a way to encourage healthy behavior without regulating choices. We wanted to honor those at our school who were doing great things with the hopes that others would take notice and do the same. From this, the Matoaka GOLDEN APPLE AWARD was born. 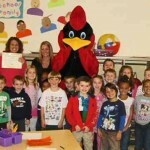 Throughout the year, Michelle and I seek out nominations of those who are “caught being healthy.” Then, three times a year we surprise the winners with certificate and visit from our school mascot. Awards have been given to teachers who have healthy snack ideas or classroom activities, parents who make healthy treats for class birthday parties (instead of cupcakes! ), and staff members who have helped with everything from Running Clubs to Zumba classes. In an effort to decrease sugary treats at school (such as birthday cupcakes and class party cookies), a healthy snack initative was created. Throughout the year, we promote healthy options whenever possible at all school events and celebrations. For instance, we encouraged the Dad’s Club to switch their annual “Dad’s and Donuts” breakfast to “Dad’s and Bagels.” Our school movie nights now sell fun fruit creations and homemade smoothies instead of candy and chips. This initiative calls on all of our parents, teachers and PTA members to be conscience of the message they are sending to kids through our many school functions. Even our ice cream socials now offer a fruit topping bar instead of candy and cookies, proving that there are always options for healthier alternatives – even at an ice cream party. Working together with our school Wellness Council, the PTA and SHIP, our Healthy Lifestyles Committee is collecting recipes from school families that focus on healthy school lunches from home, nutritious and fun snacks, and alternative celebration ideas. Families can send recipes in with their child, via email or submit them on our PTA website. A school garden, which can serve as a beautiful outdoor classroom, is a great way to reinforce your school’s commitment to healthy lifestyles. Getting teachers and students involved in planting and harvesting will not only help with upkeep but will also provide numerous learning opportunities in the areas of not only nutrition but also geography, science, math – even the seasons! Another great idea is to have school families “adopt” the garden over the summer allowing them to keep the harvest in exchange for their work. • Host Annual Healthy School Events. With the help of a dedicated staff and PTA, Matoaka sponsors a variety of events that focus on wellness, fitness and healthy lifestyles including an annual ‘Walk a Thon’, a family fitness night and staff verses parents games. This year we hope to streamline our programs including our Local Produce Initiative. We are beginning to consider how we might influence school constitutes to adopt a healthy lifestyles policy or improve school lunch. But more importantly we hope to further our reach in the community by sharing our know-how with other schools and PTA committees. Our experience has shown that, regardless of funds, resources or experience, a small group of dedicated individuals can work together to make a positive impact on the health and wellness of children. FANTASTIC INFORMATION! Love the idea of using Pinterest to create a free healthy pinning board for parents. I am wondering how other schools can create a website like the one used by your school PTA? I created the PTA website in WordPress. I have experience in the industry and have advanced skills in web design, web marketing/SEO and web management. I realize that it might be difficult for schools to find someone willing to volunteer the time and effort but WordPress is an excellent solution. There are a variety of free templates that can be customized by someone with moderate skills. WordPress offers calendar plugins and many others allowing you to create a very organized and easy to manage page. The trick will be finding someone willing to invest the time in the build-up.